Since grade level parking lots are cheaper to build than multistory garages having the space parking is a means to save on the project cost while ensuring the hospital can accommodate future growth. As an added bonus Parking Fees, for better or worse, have become a major way for hospitals to generate revenue, with lots of parking lot space available revenue generation is certainly an opportunity that would be tough to pass up. The Total Cost and at What Costs? @WinStarDylan that site brings with it a lot of extra costs – road widening of lauzon, 42, 9th con. Has the prov said if it will fund that? The proposed site comes with costs. With $200 million to the municipality it and another $100 million for infrastructure the simple question of how Windsor and Essex County will pay for the hospital is a fair one. From what I understand that $200 million hospital cost will require a 3% levy for the city but that amount is before any infrastructure cost or ANY other spending. I heard a rumour that the County is contemplating a 2% Levy to cover their share of the costs, although that is not confirmed. Lets be honest, this is another long term project for Windsor-Essex. David Musyj was quoted as saying about 4 years before shovels are in the ground. The construction of the new Grace site, re-purposing of the downtown campus and demolition of the Met site would only occur after the mega-hospital is open meaning likely not starting for at least 7 years. The only project that appears to be shovel ready is the expansion to the Tayfour Campus, assuming the funds were available. Given the fact that the project hasn’t yet been approved by the Ministry is a big blow in my opinion as a lot of fanfare was made over a project that could, in theory be still sent back to the drawing board. The takeaway from this, as with all long term planning, is that the city could be a drastically different place between now when shovels hit the soil and when the doors are open for patients. This project has a time-frame beyond the term of city Councillors, MPPs and MPs; it is a legacy project for some of them but in all likelihood many of the current politicians won’t be in the same positions when the hospital is finished meaning its legacy for good or bad will be for someone else to deal with. Both hospital CEOs stated during the day long announcement, that the new hospitals will not result in any significant new permanent jobs as the majority would just be moving and consolidating from existing locations (the new dialysis unit will require new staffing). So beyond construction the hospitals themselves, they will not be a long term net job creator for our region. Of course there will be lots of construction jobs building/rebuilding the various sites. That being said those jobs aren’t permanent, and in some cases they will be going to people who don’t live in Windsor as specialized workers will need to be brought in. The (re)development of University Ave. and the lands near the new Mega-Hospital will see doctors move their offices but the net economic benefit will be negligible as offices will be left vacant as they move closer to the new hospital. This movement of offices will happen as many of the doctors who have offices near the current hospitals, have patents in those hospitals yet use the offices for outpatient services and appointments. They will not want to drive or take transit (LOL) between their existing offices and the half hour or more to the mega-hospital site to see patients. This will leave existing facilities vacant and the question of who is going to move into these buildings when there is already a glut of vacant retail and commercial space in Windsor? The demolition of the Met site will likely see a new mix use space developed (in 10+ years) adding to the glut of commercial space in the region. Additional residential development is nice but but it isn’t going to change a whole lot other than adding a few dozen property to the city’s tax bases. If the city is serious about its plans to improve transit, walkability etc. this residential development (along with any development at the Old GM plant) should be medium or high density in nature to maximize the number of people being drawn into a central part of the city. Given the time-frames that are attached to this project, the new mega-hospital could threaten the existence of Leamington District Memorial Hospital. With a world class, state of the art, cutting edge medical facility (all terms used to describe the hospital) 20 minutes by Ambulance from Leamington (after Lauzon is extended to Highway 3) there should be real concerns about the viability of Leamington’s Hospital. Despite saving the birthing unit under a new model, that doesn’t mean that in 8-10 years when the new system in place those services will be viable or be supported by a cash strapped province. A clear argument could be made to turn Leamington Hospital into an Urgent Care Centre similar to the Grace site with overnight emergencies being transferred to the new mega-hospital site by EMS. An argument could even be made that the new Mega-Hospital could pose a risk to Chatham-Kent’s Hospitals as easy access from the 401 could see specialized services centralized to Windsor in the future. The local bill for the new hospital — and its three satellite sites within the urban core — is estimated at $200 million, which could be paid for in many ways, Musyj said. Some communities have used tax levies or borrowed cash with a 20- or 30-year repayment plan in order to spread the cost to users over time. Communities can also reduce the overall financial burden by offering up land or they can raise funds. Either way, the region’s ability to come up with its portion of the cost illustrates to the ministry the level of support for the new hospital. Without that buy-in, the less likely it is government will support the project overall, according to Musyj. Although Mayor Dilkens was quoted as saying that no fundraising campaign could cover the cost of the hospital, hence the proposed levy, does anyone believe that the hospital will not be running an aggressive capital campaign to support this new hospital? Once plans are finalized, the hospital will need to be furnished, new medical equipment acquired and other bells and whistles added in. 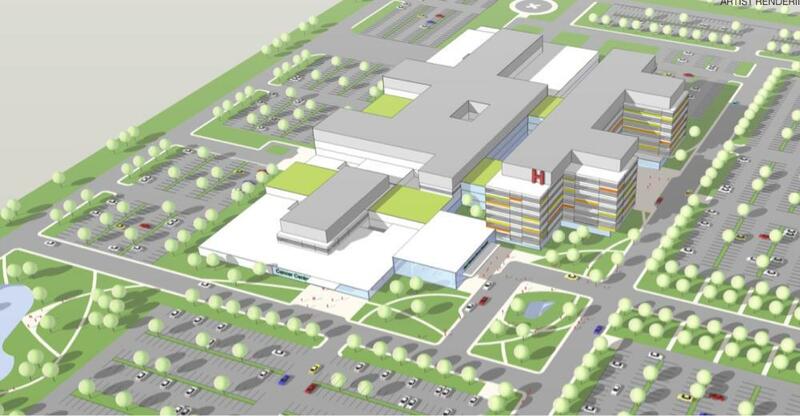 This hospital will possibly be one of the largest capital campaigns run in our region with the potential to devastate the fundraising and capital development of numerous non-profits and charities across Windsor-Essex County. Despite Windsor-Essex County being one of the most generous regions in Canada, given the difficulties in our local economy and the wide range of needs in our community are residence willing/able to support their existing affinities as well as give to support the Hospital? Even if the goal is 5% of the hospitals total cost, a $10 million dollar campaign over the next 5-10 years is not significant to our region. The result could be a number of major charitable organizations in the community facing some tough times competing against a hospital that will be built and furnished anyways. Where is the Long Term Care? One of the biggest challenges that we face as a region is the aging of our population. As baby boomers retire and we continue to attract retirees to our areas we are setting ourselves up for a major burden to our local health care system in the years to come. Now, I understand that hospital funding isn’t the same as funding for long term care facilities but there hasn’t been or was there a single peep about long term care facilities as a part of the “re-imagining of our regions health care system”. Without a discussion about how we are going to take care of our aging population and where they are going to live, get treatment and remained connected to our community in the context of this new system we are doing a disservice to generations past and present. 1 Hour 8 minutes IF i magically have a car in Forest Glade to drive the last several KM. A bright spot that may emerge from the new hospital location is that it forces a reorientation of transit services in Windsor. Simply put having a major of buses running down Ouellette, Wyandotte and Tecumseh simply won’t fly anymore as hospital patients will need to get the new mega-hospital location. The fact that the best route that I could find on the Google Transit took over an hour from the downtown bus station just to Forest Glade, then it assumed I would magically drive the final couple of kilometers illustrates the scope of the problem. Even if buses ran to the site, if you are an employee of the hospital you now HAVE to drive a car to get to work. If you live in the Downtown or West End where before you could still reasonable take transit to get to Met or Ouellette hospital campuses, now it appears to be impossible without giving up 2+ hours per day to a commute. These concerns aren’t new to transit users/watchers in Windsor but the fact that this change is going to be occurring over the next decade does give hope that the system will be forced to change. That being said, I think the hospital should consider offering its own shuttle services for staff and patients. For regular patients, like Cancer patients who need to be at the hospital every day for their treatment. When I was getting radiation treatment for my own cancer diagnosis, I took the bus in Waterloo to my treatments, it wasn’t fun but it was also only a 10-15 minute ride from the University that got me home before I felt too sick. If that bus ride was an hour long, I don’t know what I would have done. Overall, I feel that the hospital got it mostly right. Although I do wish that the Acute Hospital was placed somewhere more central in the City that wouldn’t result in the uprooting of potentially dozens of doctors offices from across the city to a soybean field. At this point though there is little to be done but to mitigate the costs and challenges that emerge from this project. The community was consulted and although some may not totally agree with decision it has been made, to change the location now would mean bringing the entire project back to the drawing board and delaying the eventual hospital for a decade or more. The province as cashed strapped as it is, can’t fund everything and at some point they are going to call for cuts. This could be the one opportunity that we have to build a new hospital in our community for the next 50 years, we need to take it. You raise some good questions, though in my opinion, this location will be terrible for Windsor. You can’t move one of the largest employers from the core to the outskirts without some major ramifications to the urban fabric of the city. Also the consultation that took place was more for appearances than anything else. The criteria for site selection were very tightly controlled and, what was the most important one in my opinion – greenfield or brownfield, was firmly established before the public part of the consultation process even started. I realize the hospital might not be that familiar with the various community groups, but if they had wanted to, I’m sure they could have asked the United Way to help them reach out to their stakeholders. The location may be bad for Windsor but it is good for the region and if you look at the name of our hospital association it is Windsor REGIONAL Hospital. Personally I think the consultation process was relatively thorough but I think there was a disconnect between Windsorites who see these hospitals as their own and the hospital, the LIHN and Province that see it as a regional service. Unfortunately changing the location at this point is highly unlikely as a result we need to determine how to mitigate the negative impacts in the best manner we can. The name of our existing acute care campuses ‘Windsor Regional Hospital’ has absolutely nothing to do with location . It was chosen from a list of names way back when Metropolitan and Windsor western hospitals merged. I believe it was back in 1994 way before any talk of megahospital. Just because the name has region in it means nothing. The county has a hospital located in Leamington. 25years ago there were 4 acute care active hospitals serving this ‘region’ located in this city’s centre and now there will be none. And no one in the lead seems to be able to justify this new proposal except for the fact it is following the masses to the other side of the suburbs… A farm field across from airport. Since when did mega hospital be deemed a hospital for the region of Essex county and not the city. The name no more implies it’s for the region than the proposed location will. The name Windsor Regional Hospital was chosen from a number of names back when Met and Hotel Dieu merged way before any talk of mega hospital. If the new hospital were to incorporate a parking garage there would’ t be a need of 60 acres, and would open up many more potential locations to use saving money on infrastructure. The county has a hospital in Leamington. I cannot believe volunteers are given the position of locating this city’s health care. 25 years ago there were 4 acute care active hospitals in this city’s centre, now there will be none. City council voted down a request to open up a discussion about this, I have to ask why? Every voice needs to be heard regarding such a great potential undertaking as a city’s most important asset such as health care.